That's a freebie being given away at your local comicshop. 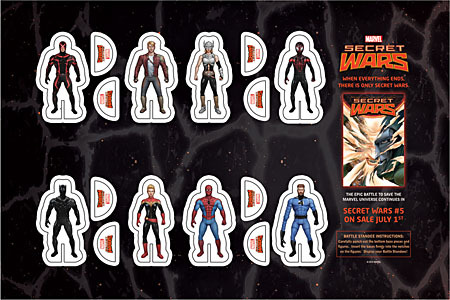 The "figures" are only about an inch and a half tall (Marvel missed a great opportunity to make them the same size as the old Mattel toys), but several comics this month are going to have "landscape wraparound" covers, showing the different sections of Battleworld, and these little guys will look nice posed against those. This entry was posted in comics, Marvel and tagged Black Panther, Captain Marvel, Fantastic Four, Guardians of the Galaxy, Secret Wars, Spider-Man, Thor, X-Men. Bookmark the permalink.